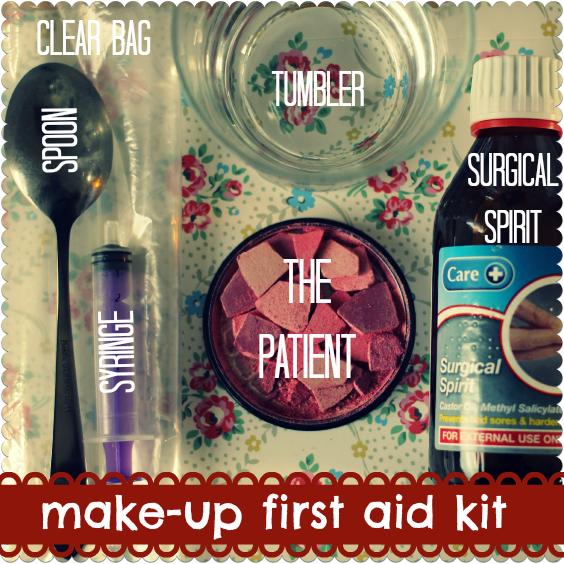 Once you know how, it’s easy to mend broken make-up. I use a mess-free method I found on Pinterest, which only takes a couple of minutes. It has saved me a bunch of money that I would have spent on spanking new replacement products. 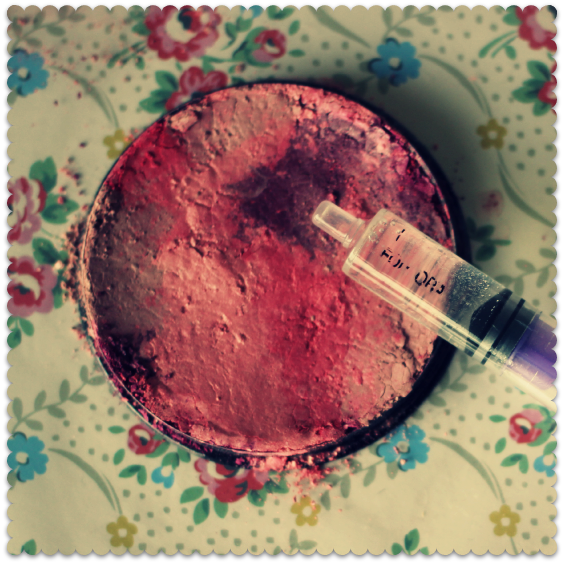 Here’s how to perform emergency first aid on your pressed powders, blushers and eyeshadows. Disaster! Smashed to smithereens. 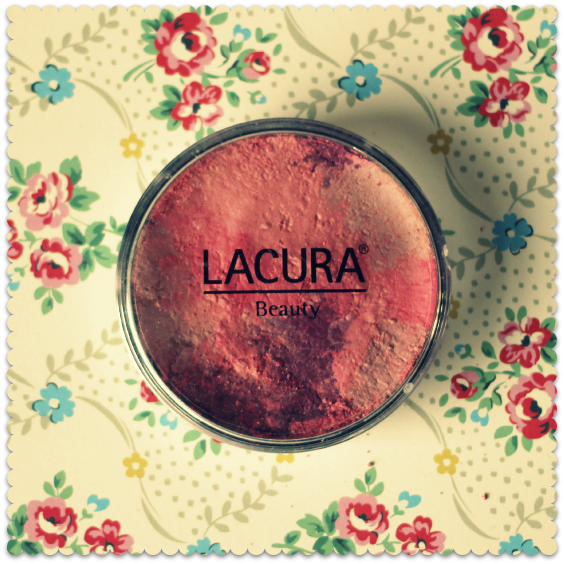 Granted, my favourite Lacura blusher from Aldi only cost about £3, but I didn’t want to replace it so soon. 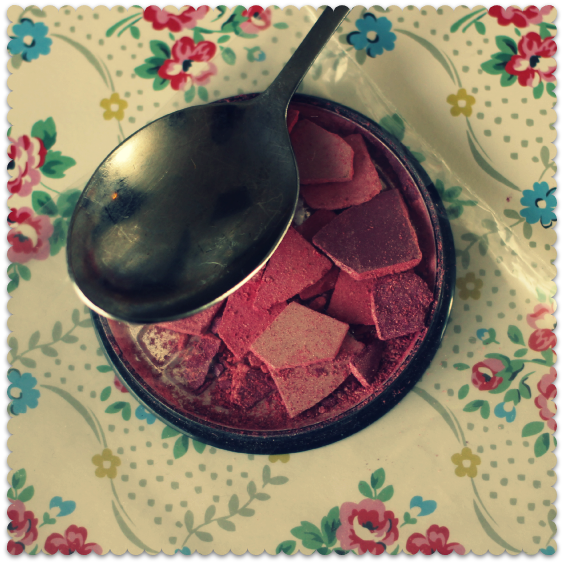 So I did what I always do when a powder, blusher or eyeshadow is smashed. I turned to the emergency make-up repair kit in the picture at the top of this page. These are all items you’ll have in the house already, with the possible exceptions of the surgical spirit and the syringe. Surgical spirit: we always had a bottle of this stuff in the medicine cabinet when I was growing up, and we used it for all sorts of things. I still do. The official use of surgical spirit, however, is for bed-sores and hardening the skin on the feet. (This last one always leaves me baffled: who wants leathery feet? Answers on a postcard, please.) As a result, surgical spirit doesn’t sell by the bucket load. I get mine from Superdrug or Boots, but I have to ask at the pharmacy counter, where they keep it stashed away like some sort of pharmaceutical contraband. The best price is at Superdrug: the 200ml bottle in the picture costs just £1.35. Syringe: one of those syringes for administering medicine to flailing tots, as opposed to a syringe with a hypodermic needle. I have a bunch of the former knocking around – and if you are the parent of a small child, I suspect you do too. If you don’t: a syringe is useful, but not necessary. A spoon and a steady hand do just fine. 1. Open up the smashed item, and place it in the clear plastic bag. 2. With the hard edge of the spoon, chop and crush the powder as finely as you can. Not just the broken bits, but all of it. This is surprisingly easy to do: dig at it with a sharp metal edge, and the stuff shatters like safety glass. 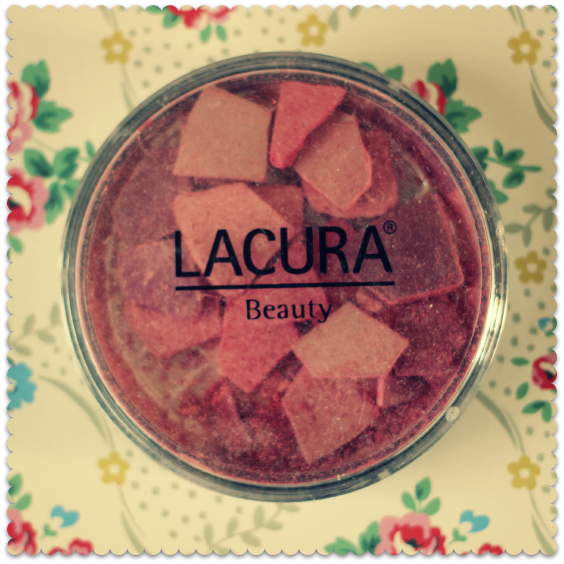 The powder is fine and the pigments can be intense – as anybody whose eyeshadow has broken and shaken out into their bag will know. The stuff gets everywhere! Putting the item into the plastic bag before you grind it up means that you don’t make any mess. 3. With the item still in the plastic bag, use the bowl of the spoon to flatten the powder. Remove the item from the bag, carefully so that the powder doesn’t go everywhere. Place it on top of the bag. 4. Squirt (or drip) surgical spirit over the item until the powder is absolutely soaked. As you can see above, for a large blusher I used a good glug. For smaller compacts such as eyeshadows, you’ll need less. The main thing is that you soak that powder through. 5. Place a sheet of kitchen paper over the item. 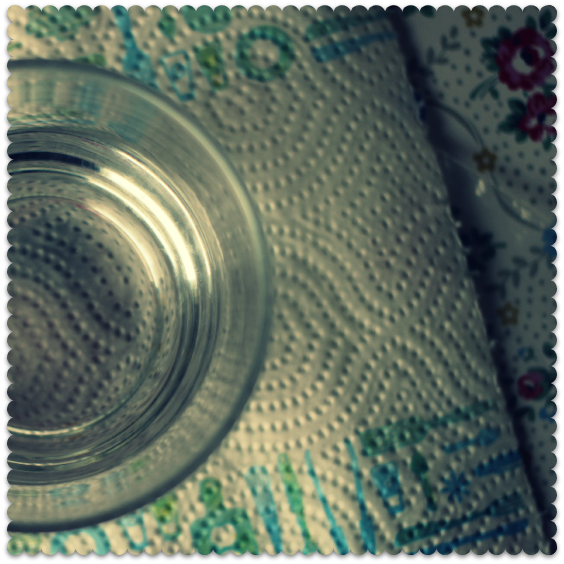 Pop the tumbler on top and push down on the bottom of the glass, as hard as you can, for a minute or two. Don’t worry: the kitchen paper won’t disintegrate. After you remove it, the powder will still be a little wet, so leave it on the windowsill for a morning or afternoon, to dry out properly. When I did ballet we used to soak our feet in surgical spirit to toughen up the skin for pointe work. Ballerinas do indeed have feet like old leather! Such a great tip! There’s nothing worse than the heart-wrenching moment a brand new bronzer falls to the floor (it always seems to fall in slow motion!) now I can smile again. Haha – I know that awful slow-motion fall very well! Something I like about this DIY fix is just how quick it is. Hope you find it useful. Very cool! I had to look up ‘surgical spirits’. OH! It’s rubbing alcohol! 🙂 This is a great tutorial and I am going to share with my friends! Thanks! 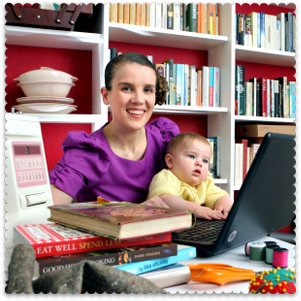 Hi, I just wanted to say I really enjoy your blog- your tips are brilliant for those of us who are trying to save money while keeping up our lifestyles! I’m just getting started in the blogging world and really enjoying it so far. 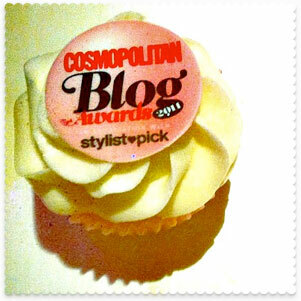 Yours is one of the first blogs I am following. I know this is an older post, but I was browsing and found it: what a good idea! I’ve thrown away 2 or 3 half full containers of pressed face powder as I’ve dropped them on a bathroom floor and the powders got all smashed up. I’ll have to try the surgical spirit trick. No, I’ve never understood that idea of bathing your feet in surgical spirit either. Too stinky. It is useful though if you wear less expensive (ie: cheap ‘n’ cheerful) earrings, and can be used to clean the ear lobes after wearing them. It can also be dabbed on to a zit to dry it out. I used to use TCP for that, but then everyone said – for seemingly days afterwards – ‘can anyone smell TCP?’ That stuff lingers like no one’s business.